After thousands of years of expansion and conquest, the imperium of man is at its height. His dream for humanity nearly accomplished, the emperor hands over the reins of power to his warmaster, Horus, and heads back to Terra. But is Horus strong enough to control his fellow commanders and continue the emperor’s grand design? This was my first real exposure to the WH40k universe which I’ve heard of long time ago. I enjoyed it, even though the book was dark, violent and gun happy. In fact some chapters seemed to me like a description of toy shop shelves for big and small boys who’ve always dreamed of buying a sword, a tank, a crossbow, and RPG’s because let’s face it, there’s nothing better than a good armoury. Fortunately there was a good story in here as well, a story about the conquest of unknown worlds and galaxies. It was complimented by a personal journey of more than one character (and Loken was my favourite). Horus Rising didn’t answer all questions it posed straight away – in other words there were plenty of plot holes around. I understood. 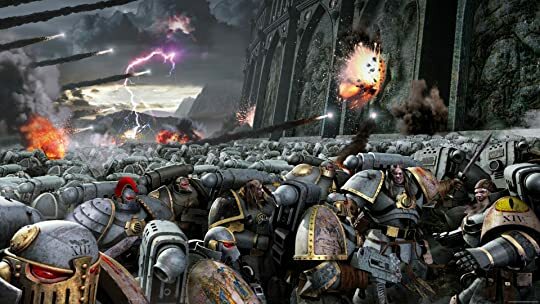 I felt it was more of an introduction, a novel beginning a series and sowing the seeds for what is to come, a novel aimed at an established group of WH40k fans. I just wish that the author took more time to explain the different terminologies in the book. Not all people play actively in WH40k after all. Quick, fun sci-fi read. A book that sets up a universe, sets up a story, and is able to present several well-rounded characters – no mean feat. If you are curious, do give it a try. By the way if you want to know a bit about the game, the whole series and much, much more, go here. This entry was posted in adventure, book review, dystopia, fantasy, grimdark, sci-fi and tagged dan abnett, horus rising, series alert, the heresy of horus. Bookmark the permalink. Try the book then :). Well, I read it and it wasn’t over my head. You’ll do fine ;p.